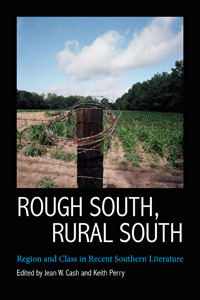 Joe Samuel Starnes: Writing about the South with "Admirable Authority and Poetic Understanding"
Writing about the South with "Admirable Authority and Poetic Understanding"
In the book Rough South, Rural South: Region and Class in Recent Southern Literature, now out in paperback from the University Press of Mississippi, Jean W. Cash writes about my work in her essay "Twenty-first Century Writers: The Rural Southern Tradition Continues." In both novels, Starnes has produced work worthy of attention, providing real insight into how misguided ambition and the power of money and government contribute to the loss of the agrarian South both physically and spiritually. Both works transcend their immediate setting through Starnes's characterization of men incapable of adapting to daily life. Starnes knows his home region and its people and how to write about them with admirable authority and poetic understanding.